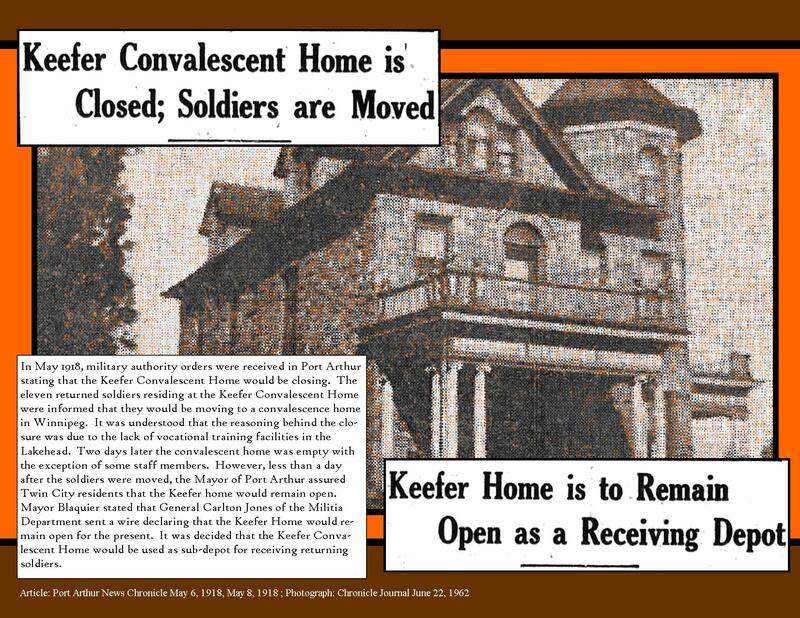 The Keefer Convalescent Home had been chosen to house and support returning soldiers, but as this telegram shows it was closed in the spring of 1918. 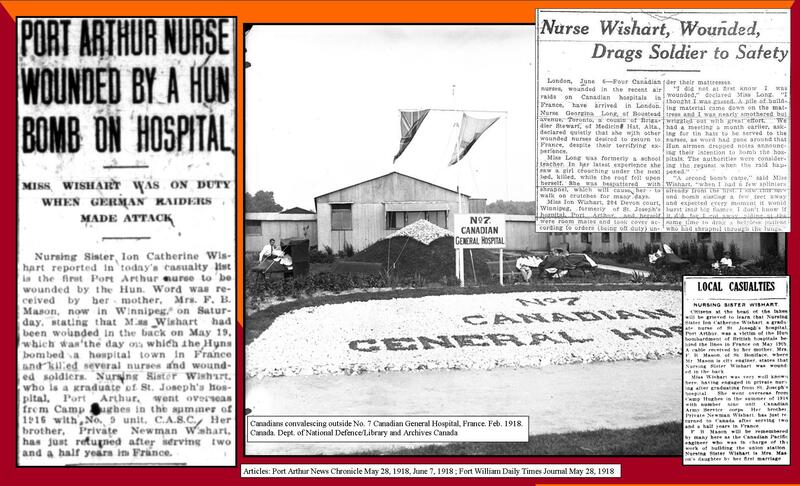 See above, and this article on the Keefer Convalescent Home for more. Though the contents are not recorded, a response was made and filed to one of H.C. Harris, the Fuel Administrator’s, regulations made in April. 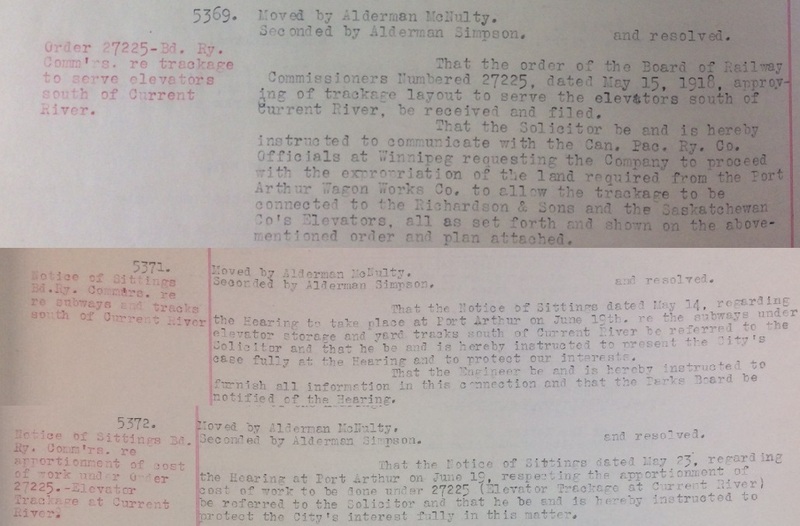 This letter was received from the Munitions Board in Ottawa, and touches on the Atikokan Blast Furnace and the closure of the Soldier’s Home in Port Arthur. These issues were important enough that the Mayor was requested to go to Ottawa to discuss them. In April, the Garden Club proposed to meet with teachers in Port Arthur regarding a Garden Competition between teams of boys from each school. They met on May 3rd to begin the planning of the competition. They decided that the School Board should be asked to provide a grant of unknown value towards the project. At the same time, the Garden Club was also planning a Dominion Day Celebration for July 1st, and two aldermen joined the committee. The City of Port Arthur directly supported the Red Cross through the Patriotic Tax Levy, as seen in November 1917 and March 1918, but they also paid for utilities like telephone services. As seen in March and April, Port Arthur had been negotiating to bring fish into the City to sell at the approved government rate. Eating fish was encouraged by the government in an attempt to free up more meat to go overseas. This month, an A. Clarke, with the support of the City Clerk, requested “the right to handle government fish”, and while the city agreed it withheld Clarke’s request for the right to exclusive access. The City of Port Arthur had allowed the Great War Veterans Association to use the old Municipal Building at 242 Arthur St W, now Red River Road (this building no longer exists), as a meeting place in September 1917, and the military for recruiting. Here, a Sergeant Fry of the Royal Engineers was additionally allowed the use of a room in the building to use as a recruiting office. 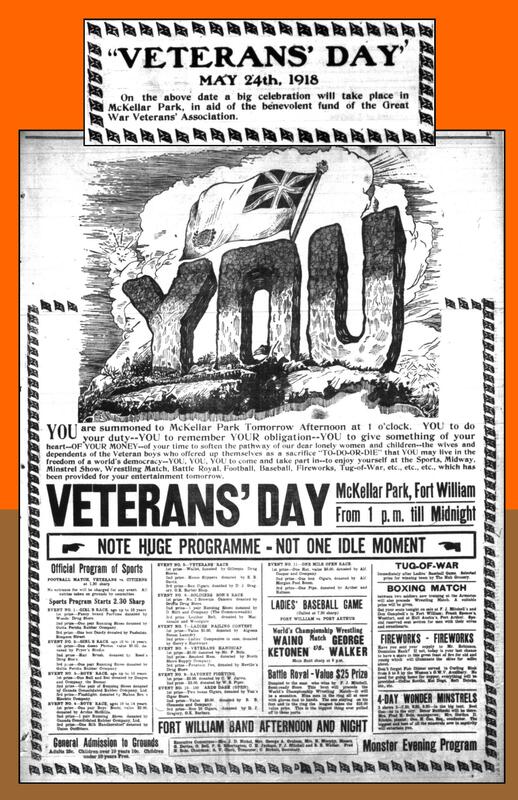 In addition to providing them a room to operate out of, the City of Port Arthur also supported the Great War Veteran’s Association in other ways. Here they are giving them a grant of $150 so that members could attend a convention in Hamilton May 24-26. A request from Henry Meyerhoff, based in New York, asking for a licence to operate a circus during the week of July 1st, was referred to the Licence Committee and Garden Club to ensure it did not interfere with established plans for the Dominion Day holiday. Council also stipulated that a portion of the proceeds be given to the Red Cross. The supply of fuel remained a problem throughout May as people would have still needed fuel for their kitchen stoves in order to cook. In this instance, Fuel Controller Wright and the City Council met with a Mr. J. A. Oliver to discuss a shortage of cordwood. The establishment of a Municipal Fuel Yard was suggested by the Licence, Relief & Charities Committee, ensuring fuel would be available for those living in the city. In the previous meeting on May 6th, the City of Port Arthur had granted A. Clarke rights to sell and manage government fish”, but at the time withheld Clarke’s request for exclusive access. This meeting they decided to undo that small restriction and give exclusive access, provided that he arranged for other dealers to have access at similar prices, and that citizens living in Port Arthur would not have to pay more than what the city department allowed. As evidence of the growth of the Great War Veterans’ Association, the Fire and Property Committee gave them the use of a further room in the Old Municipal building, one previously occupied by the Treasurer, for use as a Committee room. Like the City of Port Arthur, the City of Fort William also received a letter from J. A. Oliver, Crown Timber Agent, regarding fuel supplies for both Fort William and Port Arthur. They referred it to the Fuel Committee, but planned to have a meeting with Mr. Oliver and/or Mr. Oliver and the Fuel Committee’s counterparts in Port Arthur for mutual discussion. The City of Fort William received a letter from Thomas Craigie regarding the handling of its government fish, much the same way Port Arthur did. In response, the Mayor of Fort William appointed a committee of three to investigate the fish storage supply question and consider Craigie’s appointment. The City of Fort William had supported the development of Canadian Car and Foundry as an equipment foundry back in May 1912, which as of this meeting had just been finished. Since the plant was now fully operational, at the cost of $1,000,000 to the city and a further $2,500,000 to the company itself, Fort William asked that the bond requiring the company to pay out to the city $250,000 in the case of its failure to meet production targets be “delivered up for cancellation”. As seen in the April 1918 death notices, Stanley W. Rosevear perished in action. Council minutes show that a letter was received from Rosevear’s parents, appreciating the Council’s own letter of sympathy previously sent. In Port Arthur, more potatoes were supplied to the Garden Club, at a cost of $57. 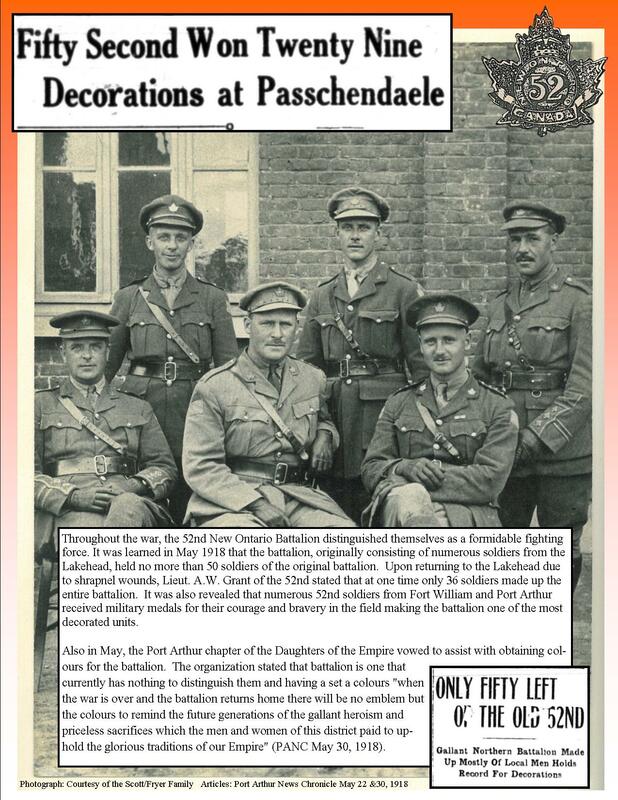 Further decided this meeting was another aspect of the Club’s role in the Dominion Day celebration on July 1st. They would sell 1000 Garden Club pins, purchasing them for $150, to raise funds for their gardening efforts. 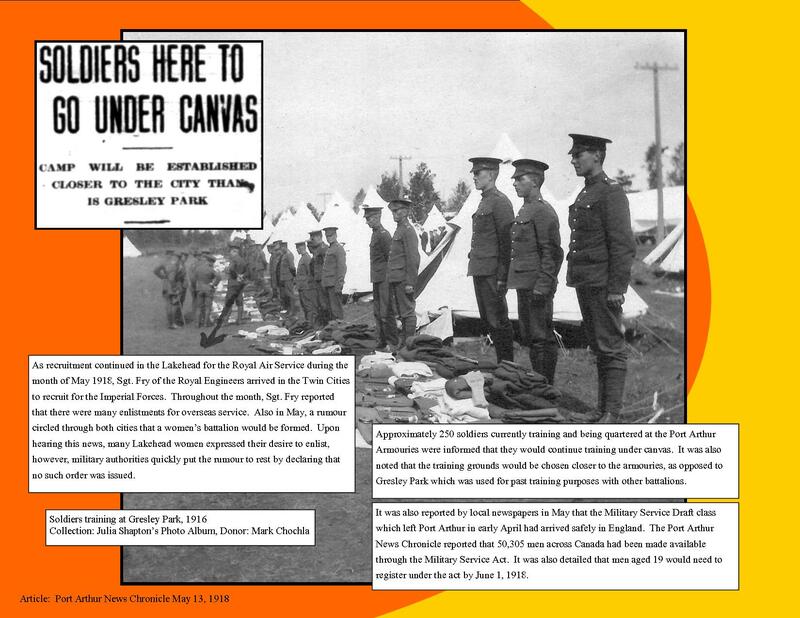 Similar to the permissions given to the Great War Veterans’ Association, the Army and Navy Veterans in Canada were provided rooms in the Ruttan Block building. This letter invites the Port Arthur Council to attend the opening, an offer graciously accepted. Although the contents were not kept, a letter read and referred to the Market Committee from the Organization of Resources Committee contained “suggestions for organization and production”. Though the contents are not recorded, and from it is unclear what the response was, the City of Port Arthur received a letter regarding coal shipments for the City from H.C. Harris, the Fuel Administrator, similar to what was received in April. Fuel in the form of coal continued to be important to Port Arthur, both for wartime and civilian purposes. As such, the City Council attempted to pass a by-law relating to its use and purchase as a commodity by the city government, but it only went through two readings. Grain shipments during the war had to be continued at great cost, and Port Arthur found itself embroiled in a legal dispute regarding connects made to elevators through spur lines south of Current River. The case involved the Canadian Pacific Railway Company and the Port Arthur Wagon works, and at this meeting City Council ensured that its solicitor would be present at negotiations to “protect the City’s interest fully in this matter”. In their last meeting in May, the City Council of Fort William received a letter from the City Clerk of Toronto regarding his proposal to abolish the Senate of Canada, asking the City pass a similar motion. Instead a Committee of two aldermen was created to investigate the issue more thoroughly. The Fuel Committee reported a need to be “authorized to secure wood limit from the Government through the Timber Agent Mr. J. A. Oliver, in order to have an availablke amount of fuel”. This was to ensure the Fuel Committee could promptly react to increased fuel need without going to City Council each time.